Manistee and Benzie Counties have a great selection of golf courses. From the beginner to the pro, these courses have the perfect challenge! With two distinct 18-hole courses, 10-acre Golf Learning Center, and amazing views, Crystal Mountain offers challenge to anyone, whether you`re a pro or a beginner. Arcadia Bluffs is a daily-fee golf club, open to the public seven days a week, from mid-April to mid-November each year, weather permitting. There are no private memberships, and every design aspect of the facility fosters enjoyment for guests of all golfing abilities. In addition to the premier layout, guests can enjoy a full practice range and separate short-game facility. GPS-equipped golf cars are available, or you may take advantage of the caddy program. Fawn Crest Golf Course is a beautiful, peaceful, and serene nine hole, 32 par golf course. It is surrounded by the beauty of oak and maple trees; it is nature at its best! 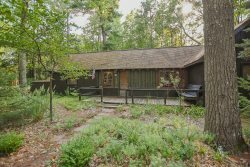 We are family oriented and invite you to come and spend quality time with your family and friends- and enjoy the wonders of nature within the Manistee National Forest. Enjoy sweeping views of Lake Michigan and the Manistee Harbor. A links-style layout weaves through heather, sand dunes, mature trees and the Lake Michigan bluff. Public play is welcome. Tee time and proper golf attire required. Restaurant is open daily. Two par-71 courses at Manistee National offer you a chance to play two very distinctive courses. Each has its own separate personality and different challenges and tests. You can`t get bored here, and you`re certainly not going to leave without playing both Canthooke Valley and Cutters` Ridge. An 18 hole championship course located in the highlands of Benzie County. Champion Hill is distinguished by its scenic, heather lined fairways, large contoured greens, and distant views of Lake Michigan, Crystal Lake, and Platte Lakes. It has multiple tees, a driving range, a practice green, and a snack bar. Great Golf at a great price! 18-Holes overlooking beautiful Crystal Lake. Seasonal restaurant. Couples nights-dinner for two and 9 holes of golf. An 18 hole championship course offering stunning vistas overlooking Crystal Lake. Pinecroft has been awarded a 4 star rating by Golf Digest. Rolling Hills and lush bluegrass fairways are features of this course noted for its challenge and variety. It offers multiple tees, a driving range, a practice green, and a snack bar.